In my art classroom, I strongly believe that art is more than a subject taught in school, but a way of life. Art allows us to not only think for ourselves but feel for ourselves. Through art, children can express what they are feeling when words fall short. I am a passionate and knowledgeable educator, who is outgoing in my approach to creating, teaching and appreciating art. I pride myself in providing children with an outlet for creativity, self expression, critical thinking and problem solving in a fun and safe environment. 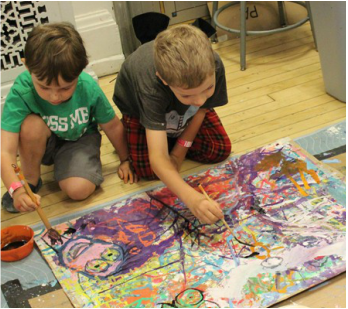 Each art lesson I teach, encourages our young artists to learn, investigate, experiment, question, judge and create art. I encourage risk taking and exploration with each project my students create. I embrace the unique qualities each artist brings to the table. In each lesson, I present material about established artists and cultures, while demonstrating a variety of art concepts and techniques. Each artist then interprets my instruction and allows their own creative and artistic judgment take over. Each artwork, although based on the same theme, comes out looking very unique as it contains a piece of the child themselves. More and more websites are coming online to give students the ability to unleash their creativity in new and innovative ways. From abstract art to pointillism, students now can click and draw their way into original works of art. Follow the links below to see some of these great resources! This site has many fun interactive games that engage students with various art forms. Design, color and print your own geometric Mandala! Explore Art History with Mati and Dada as they go back in time to visit the masters! Another great list of Art Websites for Kids! Learn about the mixed media artist Aminah Robinson and create your own found object artwork! Whats happening in the Art Room?!?! In Kindergarten Art class it is important that students begin to recognize characteristics and expressive features in a work of art. Students will describe personal thoughts and feelings in relation to a work of art as well as use artwork as a means to tell a story. In first grade, art students will continue to build upon their knowledge learned in kindergarten. We will continue to focus on color, shapes and the basic elements of art. We will create artworks similar to the artists we are learning about. Art vocabulary will start to be a part of their learning as well. Elements of Line, Shape, Form, and Texture. Second grade artists will build upon their knowledge of the elements of art to explore Art Principles of Pattern and Rhythm. We will analyze works of art and ask questions like, "How was this work of art made?" As well as make inferences about the Who, What, Where, When and Why? in a work of art. 3.) Search for your name to "edit" artwork titles and artist statments. SRES 5th Graders will explore a variety of mediums this year. We will work with paint, clay, various textiles, collage, etc. while continuing to master the elements of art and principles of design. We will invvestigate characteristics of "good" artwork versus poorly designed images. We will use our Class KidBlog as well as our Artsonia classroom to discuss, evaluate and display our creations. SRES 6th Graders will continue to build upon an already vast knowledge of the elements of art and principles of design.We will explore a variety of mediums this year. We will work with paint, clay, various textiles, collage, etc. We will invvestigate characteristics of "good" artwork versus poorly designed images. We will use our Class KidBlog as well as our Artsonia classroom to discuss, evaluate and display our creations. Check out the South Range Elementary ARTSONIA Online Art Gallery!